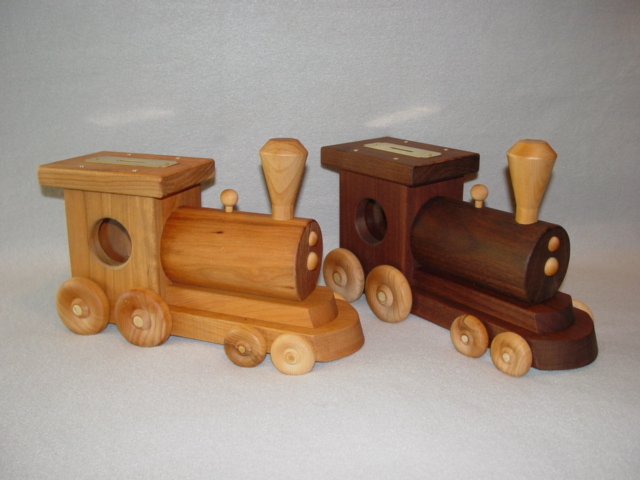 Made from solid walnut or cherry with accents in other hardwoods, this Train Bank will be a delight for your child to play with, but also to have Grandma put coins in! It is constructed with pegs to hold the wheels that spin smoothly to make this train a favorite toy. The train bank measures approximately 10 1/2" x 5" x 4" wide, is available in either walnut or cherry. The cherry is on the left, walnut on the right. A walnut plaque may be added to either bank for engraved names.